When the Catastrophe struck, the Gaule Protectorate that served as military and governance on Bordeaux Station, apparently believing an imminent attack was on the way, scrambled ships and personnel to fly out and meet the ‘enemy’. As the days turned into weeks and weeks turned into cycles, many of those left on Bordeaux began to wonder what had occurred. Had the Military been defeated by some unknown foe? Or was there some other reason they had stayed away? Either way, all they received as answers to their hails was the silent emptiness of space. The people left behind moved on and life, harsh and exacting an existence as it now was, continued. Some governed, others toiled, and others provided. Life without the Protectorate to take care of them began to seem quite manageable. Then, one day, Protectorate ships landed on the station and the military marched out, reassuring the citizenry that all was well and life would soon turn back to normal as contact with the rest of the galaxy was being restored. The provisional government of the station was afforded some small measure of respect in that they retained a voice and were free to provide feedback on the running of affairs. By and large, however, the Protectorate had stepped in to their former position as law and legislation for the station. Thus was born the Court of Fools. 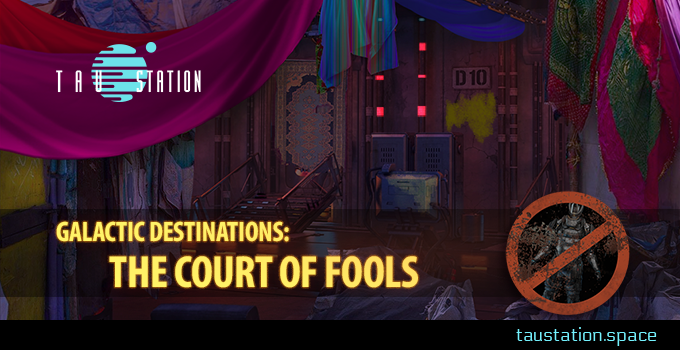 The Court of Fools represents the vestiges of the people’s government that had ruled in the Protectorate’s absence. Situated in the deep ruins of Bordeaux, the Court resides for those who prefer life away from the ruling class. Whether its location is a secret, or if indeed the Protectorate turn a benevolent blind eye to the community here seems to be in question. At the time of this article, however, there seems to be a coexistence of sorts, perhaps an awkward one, but a coexistence nonetheless. Bright colors festoon the entire area, with faux silks and fabrics draped over the dusty detritus of the old city center and walls that are painted or lit with garish neon colors that represent the locals free and passionate spirits. Often exotic sounding rhythms and voices raised in song bounce around the buildings, pulsing with their rainbow hues and lending the entire area a manic and festive feel. In the main, this is simply a place for the more colorful and independent minded to go about their day to day. Artists and street entertainers can be seen bouncing or dancing through crowds while grinning merchants ply their wares. There are, however, whispers on the dark mesh of revolution and a court that still presides over local affairs, unbeknownst to the Protectorate.